This is a very nice Ranchero that can be driven without the worry of potential inclement weather, or traffic conditions. This car is meant to be driven and enjoyed on the road! The nice rhino lined bed is a great utility to haul anything and everything around town in. The interior is nice with a newly upholstered bench seat, original gauges with added aftermarket ones to compliment and a nice simplistic early 60's look. The 4 speed and 289 are a great drivetrain combo, being used in many Mustangs, Falcons and Fairlanes it has plenty of power and low end grunt as you shift through gears. The Ford Ranchero was produced from 1957 through 1979. These were unique vehicles - they were part car and part pickup truck. In total, there were 508,355 examples constructed during its production lifespan. The Ford Ranchero constructed from 1957 through 1959 was built atop a full-size Ford Fairlane platform. They were offered in two trim levels initially. There was a Basic and Custom model. The basic trim levels were intended for traditional pickup truck buyers while the custom trim levels were offered with accessories found on the Fairlane including two-tone paint and steel bodyside moldings. The Ranchero, in both basic and custom trims, were offered with a variety of engines. The engines offered were the same offered on the Fairlane. In 1960 the Ranchero decreased in size, now being placed on top of the Ford Falcon platform. 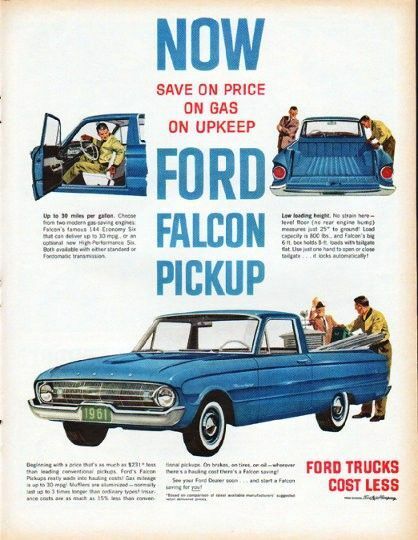 This made the vehicle lighter and less expensive than its predecessor and most full-size pickup trucks. Under the hood was a 2.4-liter straight-six cylinder engine as standard. A year later, the engine was changed to a 170 cubic-inch unit. In 1963, a 260 cubic-inch V8 unit was offered. 1966 was the final year the Ranchero was built on the Falcon platform.